This martini doesn’t have a long list of ingredients, but classic martinis never do, subsisting on quality liquor with a personalized touch of what gets the drinker’s juices flowing whether vermouth, blue-cheese-stuffed olives, or cocktail onions. The Double Black Diamond martini is even simpler than that, just Svedka citron vodka infused with fresh pineapple for 21 days and shaken up before pouring into the glass. In fact, you can see that infusion happening in the bar of most Firebird locations, layers of pineapple rings in a glass jug filled with vodka. It’s gorgeous to look at on the bar and in the glass. This martini is a wonderfully smooth and potent drink. 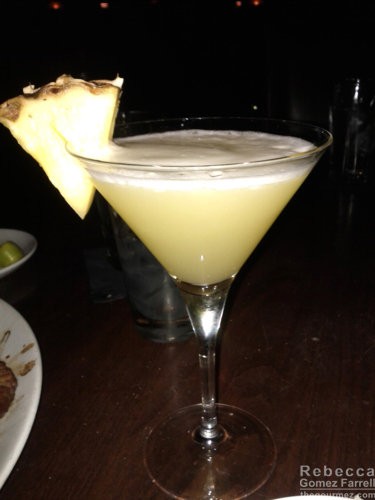 The pineapple coats your throat with some grit, making the lightly citrus vodka a pleasure to sip throughout a meal. If you’re worried straight vodka would be too much for you, see if the Double Black Diamond can’t change your mind. This drink is delicious!!! Trying to make at home, but it’s just not the same. Are they still making it? It is delicious, so I would not be surprised. On the Firebird’s Grill website, they say they use New Amsterdam Pineapple Vodka. It may very well have changed since I wrote this post, Kimberly! It’s been 5 years. Thanks for the update! Glad it’s still tasting great no matter what vodka is used.